Chinese renowned writer Yanboyuzhe (pen-name) from Shenzhen City, Guangdong Province, revealed in an interview with The Epoch Times the continuous harassment by the Chinese Communist Party (CCP) he experienced in response to his publishing an article overseas to expose the atrocities of the CCP and printing several copies of the Nine Commentaries on the Communist Party last May. During the interview, Yanboyuzhe publicly renounced his membership in the Communist Youth League (CYL) and the Communist Young Pioneers (CYP). He thought the Nine Commentaries was extremely well written and truthfully portrayed the calamities the CCP has brought to the Chinese people and the entire human race from its beginning to the present. He also pointed out that the trend of resignations from the CCP represents the awakening of the Chinese people's conscience and the importance in reestablishing moral values in China. Yanboyuzhe's birth name is Xiong Zhongjun, but he is also known as Liu Yiming. He is a member of the Independent Chinese Pen Center, a columnist for The Epoch Times and one of the founders of the Shifei Poetry Society. His work can be seen on The Epoch Times , New Century , The Democracy Net (asiademo.org) , China E-Weekly , Boxun , China Affairs , China Spring , Sound of Hope and the AOL Chinese website..
Yanboyuzhe was detained by Shenzhen City police on May 1, 2005 for disrupting social order. He was subsequently arrested on May 30 by the Procuratorial Agency for “attempting to overthrow state power” by publishing an article exposing the CCP in th overseas media and printing several copies of the Nine Commentaries to give to relatives and friends. On July 21, his case was dismissed by the police because they deemed the offense and its impact minor. He was released under the guarantee of his relatives, but he still did not obtain complete freedom. He had to report regularly to an official on his state of mind in the form of phone calls and letters. The police threatened Yanboyuzhe's career as a reporter and teacher, and forbade him from writing pieces criticizing the CCP or the government. However, Yanboyuzhe believed these threats to be illegal and resumed his writing. As a result, he was incessantly disturbed by the police and tried to avoid harassment by relocating to Zhongshan City, Guangdong Province in September. Nevertheless, after working there for a month, local police pressured his work place, and he was forced to resign. 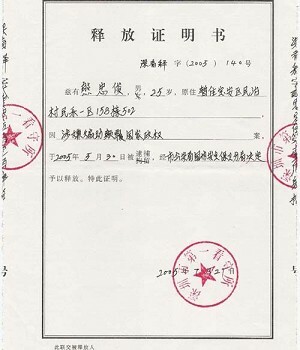 On April 5, 2006, Yanboyuzhe was detained and fined by Shenzhen City police using the excuse of examining his temporary residence license. Afterwards, the police illegally forced his landlord to expel him from his apartment. His landlord told him reluctantly that the pressure from officials was too great and that he would no longer be allowed rent his apartments if Yanboyuzhe stayed there. Yanboyuzhe said he heard at the detention center that many Falun Gong practitioners were imprisoned there. 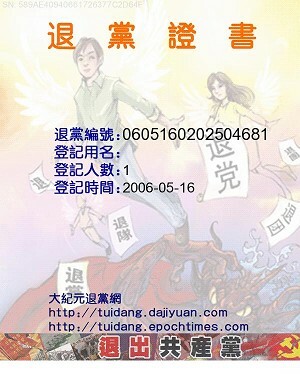 One Falun Gong coordinator named Xu Xian was sentenced to 13 years in 2003, while his wife was sentenced to 3 years. Yanboyuzhe revealed that many Falun Gong practitioners detained at the First Detention Center of Shenzhen City were moved and separated from other criminals starting last year. It is not known where they are now detained. “The CCP's suppression of people with different opinions is to protect the position of its own beneficiaries. When it faces danger of losing power, it might become a little bit more democratic. It's goal, however, is absolutely not for the benefit of the public, but for its own long-term autocratic purposes.